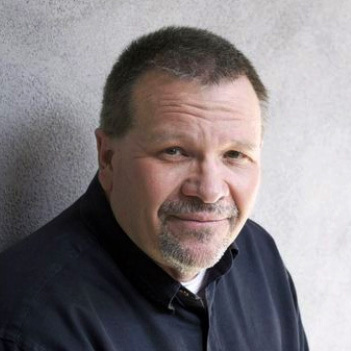 We are proud to share our executive director, Lee Pioske’s personal op-ed featured in azcentral. Thank you, Lee, for shedding light on a topic that isn’t always so easy to talk about. My Turn: Were those closest to Prince blind to a possible addiction? In reality, they may not have known. When I first heard the news of Prince’s death, I was deeply saddened by the loss of this musical icon, as so many of us were. I was a big fan of his work, and actually had the chance to meet him a couple of times, having grown up just down the road from Paisley Park. 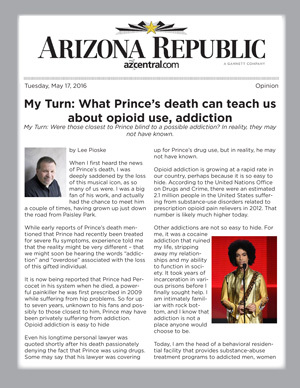 While early reports of Prince’s death mentioned that Prince had recently been treated for severe flu symptoms, experience told me that the reality might be very different – that we might soon be hearing the words “addiction” and “overdose” associated with the loss of this gifted individual. It is now being reported that Prince had Percocet in his system when he died, a powerful painkiller he was first prescribed in 2009 while suffering from hip problems. So for up to seven years, unknown to his fans and possibly to those closest to him, Prince may have been privately suffering from addiction. Opioid addiction is easy to hide. Even his longtime personal lawyer was quoted shortly after his death passionately denying the fact that Prince was using drugs. Some may say that his lawyer was covering up for Prince’s drug use, but in reality, he may not have known. Opioid addiction is growing at a rapid rate in our country, perhaps because it is so easy to hide. According to the United Nations Office on Drugs and Crime, there were an estimated 2.1 million people in the United States suffering from substance-use disorders related to prescription opioid pain relievers in 2012. That number is likely much higher today. Other addictions are not so easy to hide. For me, it was a cocaine addiction that ruined my life, stripping away my relationships and my ability to function in society. It took years of incarceration in various prisons before I finally sought help. I am intimately familiar with rock bottom, and I know that addiction is not a place anyone would choose to be. Today, I am the head of a behavioral residential facility that provides substance-abuse treatment programs to addicted men, women and veterans. Here, I have the privilege of leading multiple programs that help people overcome alcoholism and addiction, from 30-day to 90-day residential treatment programs designed to empower clients and residents with the tools they need to succeed in treatment and life. These programs are not just for the rich and famous. There are affordable options that have helped thousands of individuals reclaim their life. It is my hope that as we mourn Prince, we use this as an opportunity to heed the warning call, to talk to our loved ones who might be suffering from substance abuse and to let them know that help is available. Lee Pioske is the executive director of Crossroads, a drug- and alcohol-recovery residential facility, and a member of Gov. Doug Ducey’s Arizona Substance Abuse Task Force. Email him at lee.pioske@thecrossroadsinc.org.